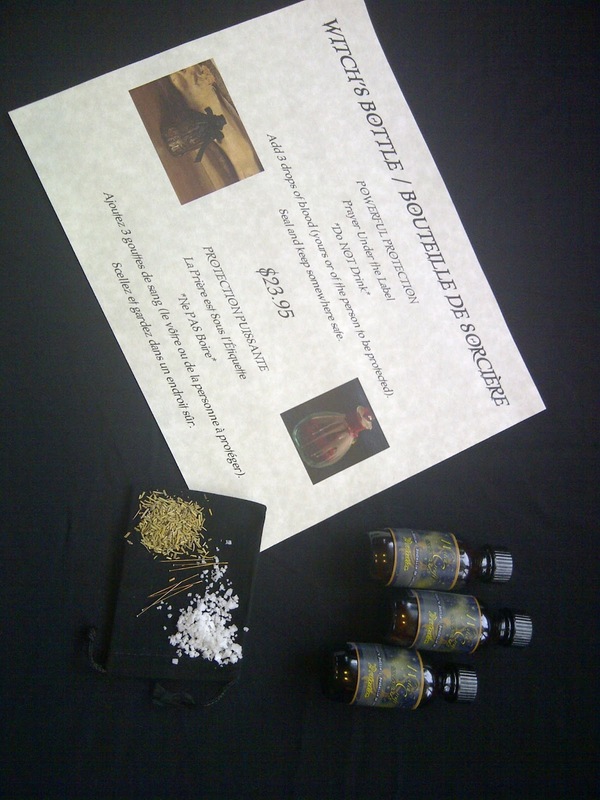 Witch Bottles have a history through discovery of them recently and some small scripts refer to them. Folklore historians have collected them, x-rayed them and found that they date to the Seventeenth century and contain a number of ingredients. They were meant to protect you from harm and curses, inflicted counter harm to those with ill intentions towards you. Often found buried under the hearth or threshold, buried on the corner or entry to your property, or buried at crossroads. 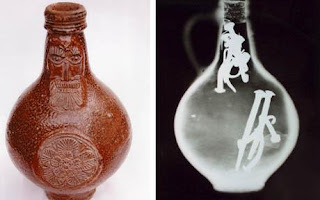 Witch Bottles were traditionally clay wine bottles, though any bottle can be used. Inside you would fill it part way with sharp objects like: broken glass, nails, pins, razor blades, barbs, fish hooks, twisted wire, thorns, etc. These sharp objects were used to cut and stab and harm those trying to harm you. The bottle would then be filled with some red wine (causing the evil to drown) and bodily fluids of those it is to protect, such as: blood, urine, or menstrual blood. Red knotted string often is added to entangle and trap evil-doers. Other ingredients include salt, sand, sage, rosemary and stones for protection: obsidian or hematite. Instead of wine, one can use vinegar or lemon juice. After all the contents are within, the bottle is then corked or lidded. 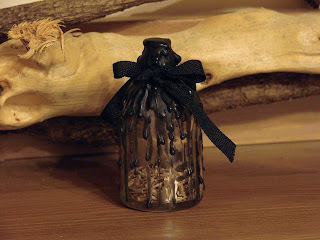 A candle is secured on the top and burned down completely, allowing the wax to meld down over the bottle to further seal it. These protective bottles originated in England with a small selection appearing in Pennsylvania. This is NOT gentle magic. Create with great care as you are working with dangerous magic. Though, sometimes, this is necessary in order to protect yourself and those you care about. 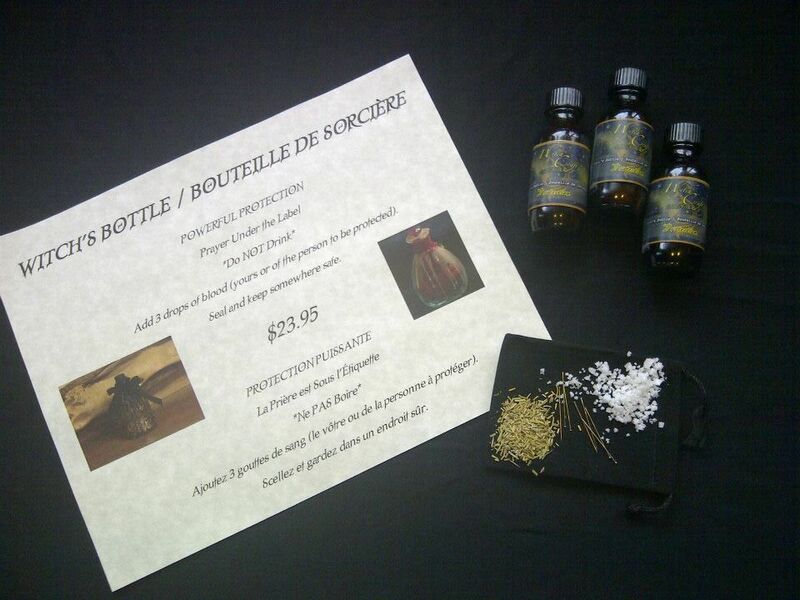 While these focus on protection, spell bottles can be made for all kinds of purposed beyond the original concept. What changes are the ingredients and where you keep it. We at Melange Magique/The Magical Blend have now made available, charge and started Witch's Bottles that you need only personalize, seal and put to use. These are currently available in the store. They will be online in the coming week or so. If you want one added to your online order, simple call the shop with your order number and let us know.